Tall clusters of Foxglove spikes lend stateliness to a garden that no other flower will impart. Plants bear many beautiful speckle-throated flowers in an array of colors atop leafy stems. If spikes are cut before going to seed a second bloom is very often obtained. 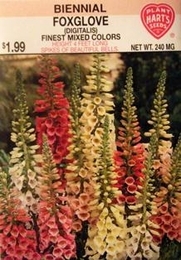 Foxglove Digitalis Purpurea does best in partial shade but will grow in full sunlight if the ground is kept moist. Thinning - when plants are 3-4 inches tall thin to 6 inches apart.